Swissgear GA-7305-14F00 Synergy 15.6 Inch Laptop Backpack. 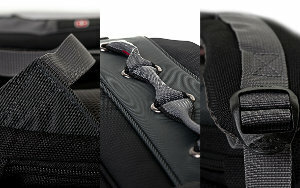 Swiss gear presents a superb and modifies laptop bag. 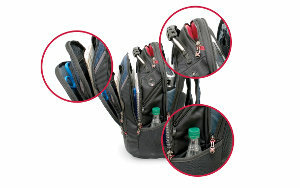 Swiss gear ensures the maximum protection to your precious laptop and make you have your laptop compact in a superb zipper that give you a utility of even extra compartments for better setting of laptop. The bag is all made up of padded rigid material that ensures the maximum protection of your laptop without making it viable for the users to have maximum protection while you are carrying your laptop. 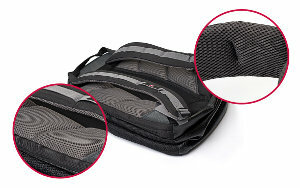 The bag is fully designed with the various multiple compartments that are fully padded in order for the maximum protection of not only your laptop but also the various other supportive devices such as charger, SD card storages and other various devices for their protection as well and also helps you to pull them put without the hassle of losing them in a big bag. The bag is equipped with one small handle that helps you to carry your laptop bag easily with all of your things compact in one bag and you just need to carry all with one handle. It also has the two larger loops that you can put it on both of your shoulders like a school backpack so that your hands are free and still you will be carrying you backpack easily with all its components related inside packed.